This season is going so fast I can't keep up with it! 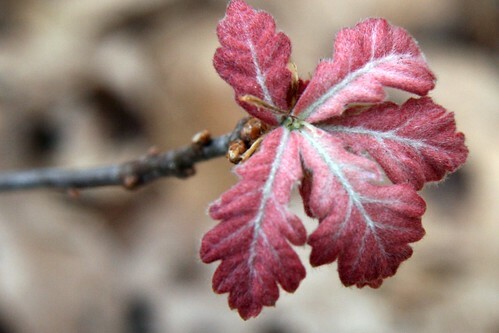 Already the oak leaves are opening. I am planting more by my calendar than phenology, just because I can't seem to keep up this year. The dandelions have been open a week and I still haven't finished planting my potatoes and I haven't started planting my carrots. I will keep trying to catch up. When red winged blackbird females return its time to plant peas. When the chickadees build their nests, plant peas and spinach. When dandelions are blooming plant potatoes, beets, lettuce, spinach and carrots. When the iris bloom, plant the peppers and eggplants outside. Plant beets, lettuce, spinach when lilac is in first leaf. When lilac blooms, plant beans, cukes and squash. Plant corn when oak leaves are the size of squirrels' ears. Plant your corn when apple blossoms start to fall. I LOVE this post. =) It's a great image, and I think such phrases (whether or not their accuracy endures global warming) are intriguing and potentially v. useful. =) Mostly I love the folksy feel. And I recently posted a link to a citizen science project where folks let the organizers know when certain things are budding, blooming, leafing, and lilacs are in their top 10! I assume from info on your side bar it's okay I've linked to this post from my blog? Phenology is so cool but when it all blooms at once due to the freakish weather it makes for stressful gardening! Oh so true, Stacy. My irises popped open today and the lilacs look like they may open tomorrow. I think its too early to plant corn. I don't know about squash. I planted squash yesterday inside and it will be under warm lights for a couple weeks. This week is supposed to be cool (upper 30's at night, *F). Maybe the corn and squash ones should say "start thinking about planting then..." I will wait 2 weeks. Those look big for squirrel ears. Were you zoomed in? :-) I'd have to have a squirrel sit by the leaves to compare. A squirrel with ears this big would look more like a rabbit. I think the leaves (white oak?) in this photo are about 1 to 2 inches long. About actual size the way it shows up on my computer. In a previous life-time an old man came into our shop each day with a quirky little saying about the weather "Rain before seven clear by eleven." That sort of thing - I wish I had this list then he would have been so impressed with me! I was feeling like it was time to plant squash and the lilacs starting blooming a few days ago! Of course, I still don't have my potatoes in, but sticking a few seeds in the ground is easier than prepping the soil and large containers that I'm using for potatoes -- first year growing them in my garden and I'm probably overthinking it.